Wales great Ian Rush says Ole Gunnar Solskjaer must be allowed to continue as Cardiff City manager, even if they are relegated from the Premier League. Cardiff's 3-0 home defeat against Crystal Palace on Saturday left the Bluebirds six points from safety with just five games remaining. But even if Cardiff are relegated, Rush says Solskjaer must be allowed the opportunity to take them back up. "He's there now, give the lad time and see what he can do," Rush said. The Bluebirds are 19th in the table, one place off the bottom following basement side Sunderland's 5-1 defeat at Tottenham. Cardiff's board of directors, including owner Vincent Tan, opted to sack Malky Mackay as manager at the end of December 2013. 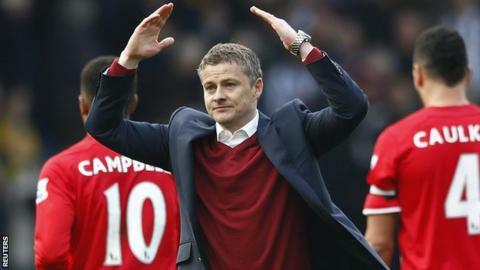 Solskjaer, 40, the former Norway and Manchester United striker, was appointed Cardiff boss on 2 January on a 12-month rolling contract. In the 13 Premier League games since Solskjaer took charge, Cardiff have won just two games, lost nine and conceded 31 goals. But Liverpool great Rush, 52, who scored 28 goals for Wales in 73 appearances, believes that Solskjaer needs more time to reshape the Cardiff squad to his requirements - even if that takes place in the Championship next season. "If Cardiff do get relegated - hopefully they don't - you say [to Solskjaer] 'your job now is to get us back in that Premier League' and give the man a chance to do that," added former striker Rush. "When you get rid of a manager it's a gamble; sometimes it works and sometimes it doesn't. "You look at Tony Pulis at Crystal Palace and it's worked. "It was a big decision to [sack Mackay], but now they've made it they've got to stick by it. You can't keep chopping and changing. "People want instant success and it doesn't happen anymore. Managers need time to build their own teams. "I look at Cardiff and Swansea and it's great to see them in the Premier League and you don't want to see either of them get relegated, because it's a lot harder to get back up. "It took Cardiff a long time to get there and for them to go back down and fight again, it's going to be really difficult. "From Cardiff's point of view it will be a nightmare to see them get relegated because they are a big club, they get great support and they've got to try and bounce back again. "It looks to me those bottom three are all favourites to go down." Cardiff go to Southampton on Saturday seeking just their second away win of the season.